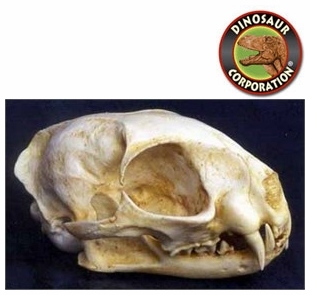 Bengal Leopard Cat skull replica is cast from original specimen. Felis bengalensis. High and low forests of east Asian continent and islands. The name "Bengal cat" was derived from the taxonomic name of the Asian leopard cat (P. b. bengalensis). They have a "wild" appearance with large spots, rosettes, and a light/white belly, and a body structure reminiscent of the ALC but once separated by at least four generations from the original crossing possess a gentle domestic cat temperament.